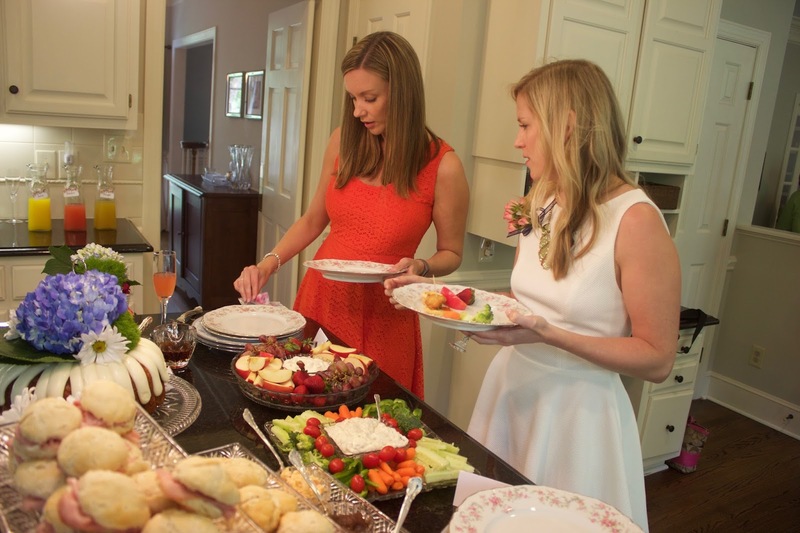 Last month I had the honor of hosting a bridal shower for a girlfriend leading up to her wedding. 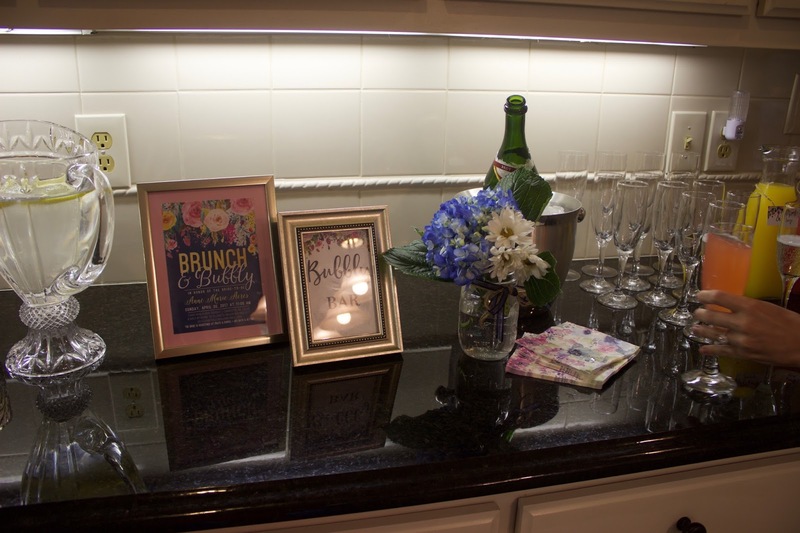 I went with a Brunch and Bubbly theme and it was a hit. I hosted the shower in my home on a Sunday morning. I love hostessing but one thing I have learned since Madeline was born is how important it is to prep everything ahead of time. So, the night before, I poured myself a glass of wine and then set out all the serving pieces I planned to use and put together my flower arrangements. I kept the flowers very simple by picking up a mixed bouquet and some blue hydrangeas from Trader Joe's and then cutting some knockout roses from my yard. I arranged them in mason jars and tied a little navy ribbon and burlap twine around each. 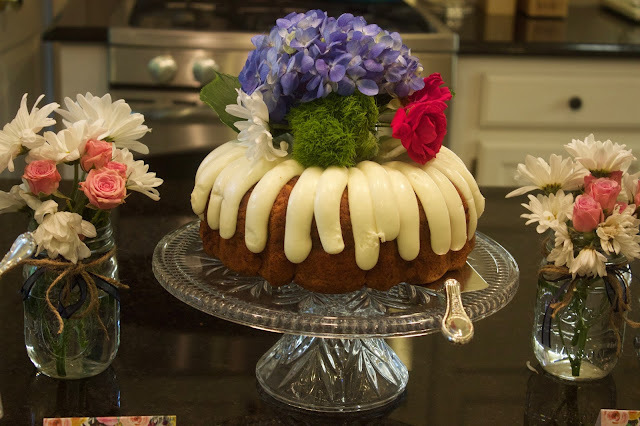 For the menu, I chose a cake from Nothing Bundt Cakes and added flowers to the top myself. I took Madeline with me and let her taste the flavors and we decided on white chocolate raspberry. I set up a biscuit bar with tea biscuits and my mom's homemade pear preserves, apple butter, and pimiento cheese. I also prepared a few ham biscuits with a dill spread. My mom always makes these for showers and they are always a hit. They didn't disappoint this time, either. I used the same homemade dill dip to serve with fresh vegetables and prepared a fruit tray with cream cheese yogurt dip. I served mini frozen quiches from Costco and mini chicken n' waffles. These were for sure the highlight and were so easy to prepare. 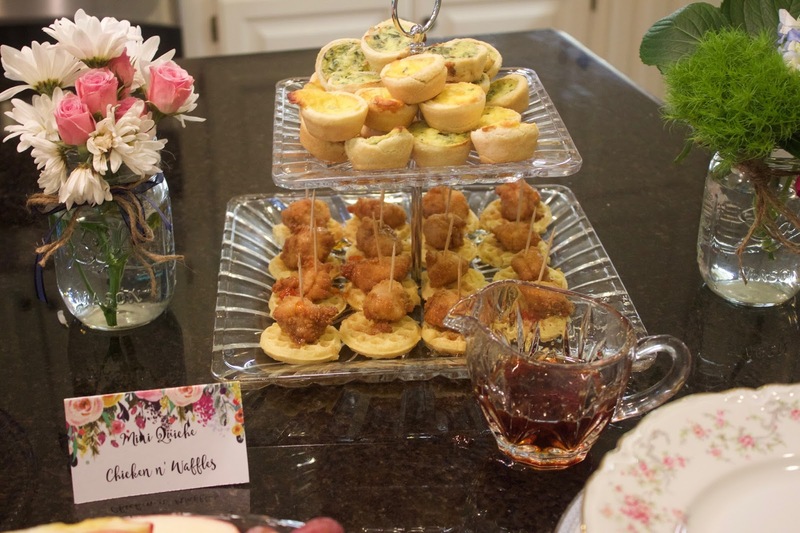 Simply order some Chick-fil-A nuggets and place them atop mini Eggo waffles. I mixed red pepper jelly with maple syrup to drizzle on top. These will definitely be served at any future morning showers. 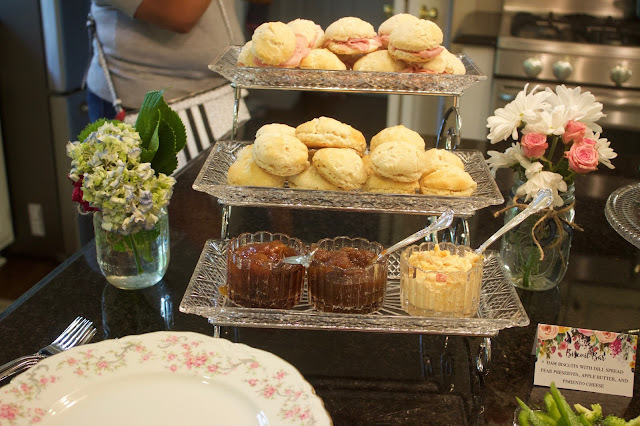 We dined on vintage china that was passed down to me by a close family friend who had no daughters. The pink floral scalloped design was so perfect for a shower. For beverages, I made a very simple mimosa bar of champagne, orange juice, pineapple juice, and grapefruit juice and set it up next to the framed invitation and a pitcher of lemon water. Aside from the flowers, I kept the decorations to a minimum and just hung a Bride to Be banner from the fireplace that matched the invitation. We showered the bride with so many fun gifts to celebrate her upcoming marriage. 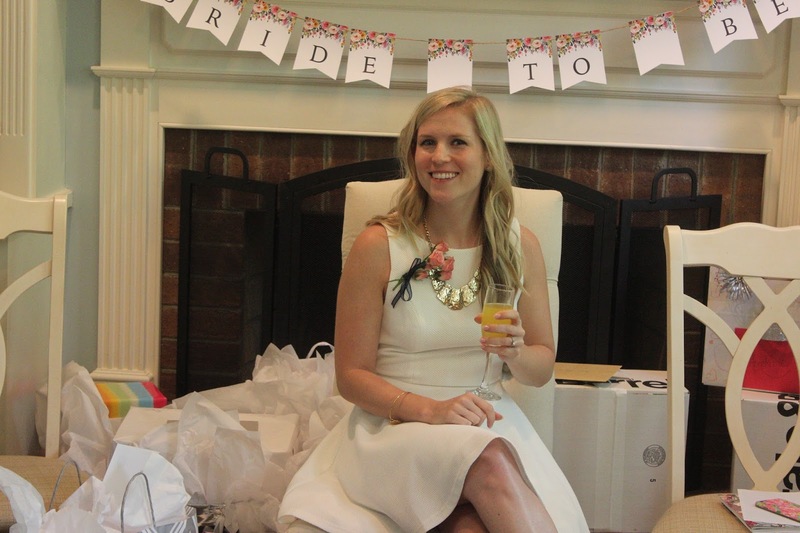 We had a great morning sipping champagne and celebrating our bride. I am so excited to share this recipe with you today because it is one of my family's favorites year round. In the winter, we enjoy this over zoodles (zucchini noodles) or a bed of spaghetti squash. In the summer, I ditch the noodles and opt for a fresh salad on the side. 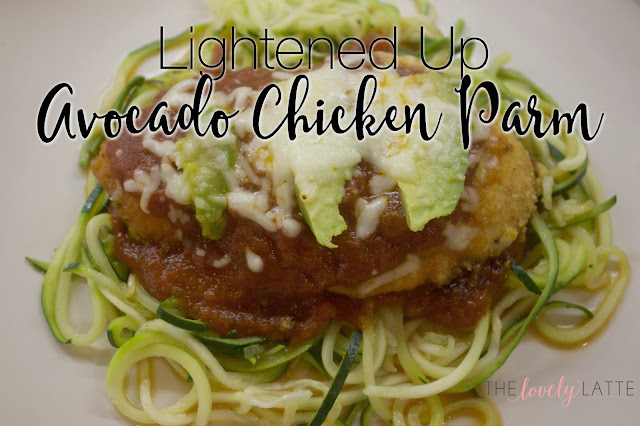 Something about adding avocado to the top of this lightened up chicken parmesan recipe gives it a really fresh flavor. Its also a great way to get in those blue containers or healthy fats. Or just fulfill your avocado craving. Unlike most chicken parmesan recipes, this recipe bakes the chicken as opposed to pan frying it. The cutlet remains moist and flavorful though so you won't feel like you are missing a thing. I use thinly-sliced cutlets when I make this dish but you could also use regular chicken breasts and pound them thin. When cooking an Italian chicken dish like chicken parmesan or chicken marsala the key is to work with a thin piece of meat. Begin by preheating your oven to 400 and lightly spraying a glass baking dish with a non-stick cooking spray. Then, combine bread crumbs and parmesan cheese in a bowl. Add your Italian dressing to another bowl and lightly brush onto chicken. If you have the time you can even let your chicken marinate in the dressing for a few hours. Dip your chicken cutlet into the breadcrumb mixture next. Place in the baking dish and add about 1 Tbsp marinara to each cutlet. Cover and bake for 20-25 minutes. Remove from the oven, add avocado and 1 Tbsp mozzarella to each cutlet. Return to the oven just until cheese is melted (about 5 minutes). You can finish under the broiler for a couple minutes if you really want to brown and crispen your cheese. I use my paderno spiralizer to make zoodles. For this recipe, I used three good sized zucchini to feed our family of three and have a little leftover for later in the week. Spiralizing zucchini is not hard but many grocery stores sell pre-spiralized if you would like to skip that step. To cook my zoodles, I simply saute them in a skillet with a little extra virgin olive oil just until they are al dente. Happy Monday. 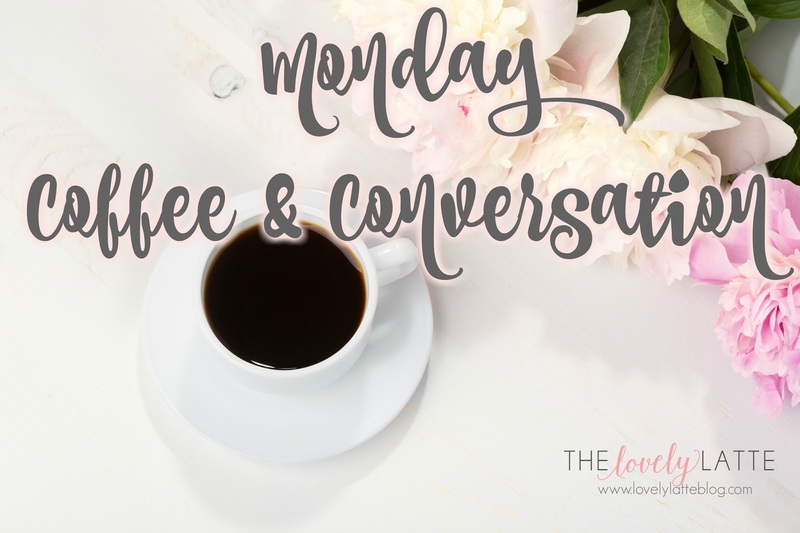 If we were having coffee this morning, this is what I would tell you. This girl has hit separation anxiety big time. Combined with beginning the transition to one nap, this has made our days over the last week pretty long. This sweet little thing just wants her mama day and night. I don't totally hate it because I know one day she won't want anything to do with me, but I still wouldn't mind getting a little more sleep. The last week has been pretty tough around here. 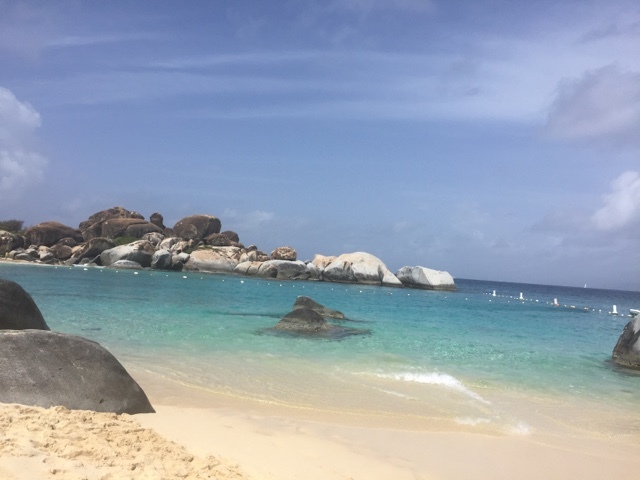 Corey and I had a great trip to St. John a couple weeks ago. I'll get around to recapping it soon but it was absolutely gorgeous and such a low-key relaxing trip. Very different from Hawaii, which was our last big vacation. 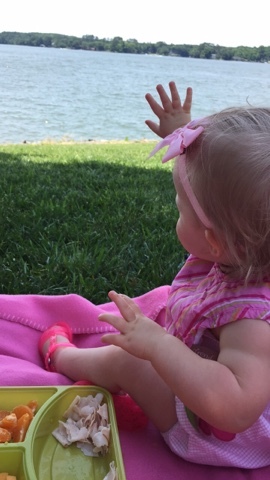 For Memorial Day weekend, we enjoyed a little lakeside picnic and this sweet girl had so much fun waving at the boats. She is fifteen months old now and had her checkup last week. 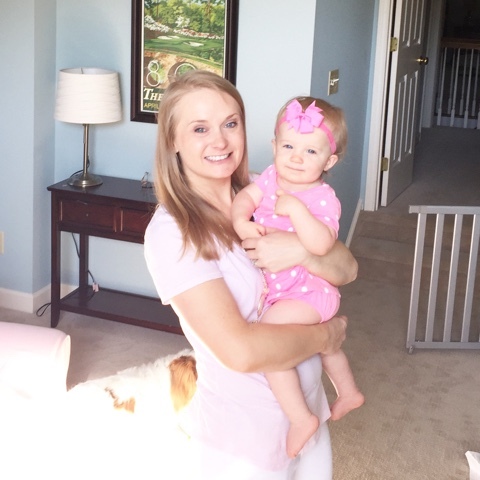 She weighed in at 21 pounds and 29 inches and is in the 20-25th percentile for both height and weight with a 95th percentile head circumference. Haha! She is perfectly healthy and was even such a big girl getting her two shots this visit. This is my favorite view ever. 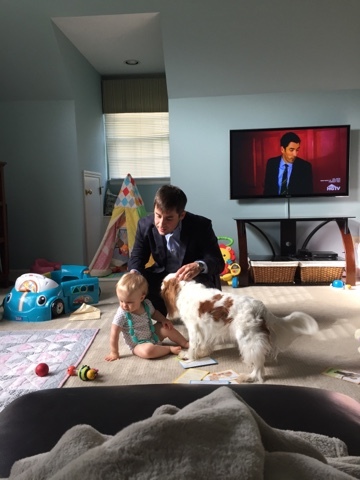 Corey playing on the floor with Madeline and Riley before heading off to work. And giving me a moment to sit under the blanket and drink a big cup of coffee. 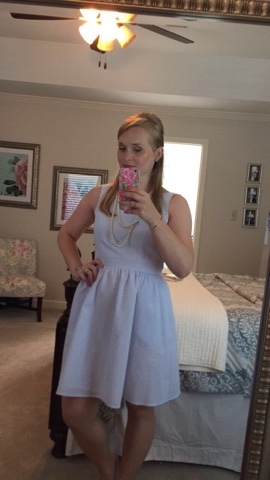 We went to a friend's wedding on Friday and I finally popped the tags off of this cute Lauren James dress that I bought right before learning I was pregnant with Madeline. 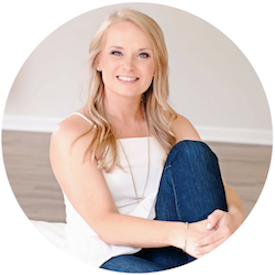 It was much too small last summer when I was newly postpartum. Since the wedding was a day time wedding, I thought it was perfect. A blue seersucker with an open back and the largest, most dramatic bow at the waist. It is one of their staple designs so it is still available in multiple colors here.